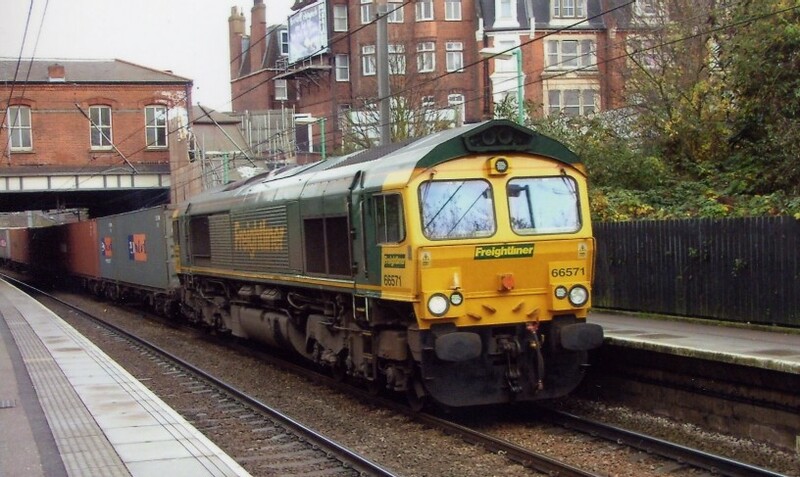 Currently the last Freightliner Intermodal 'Fred' 66577 awaits the road to join the North London Line at Gospel Oak on the 22nd February 2005. 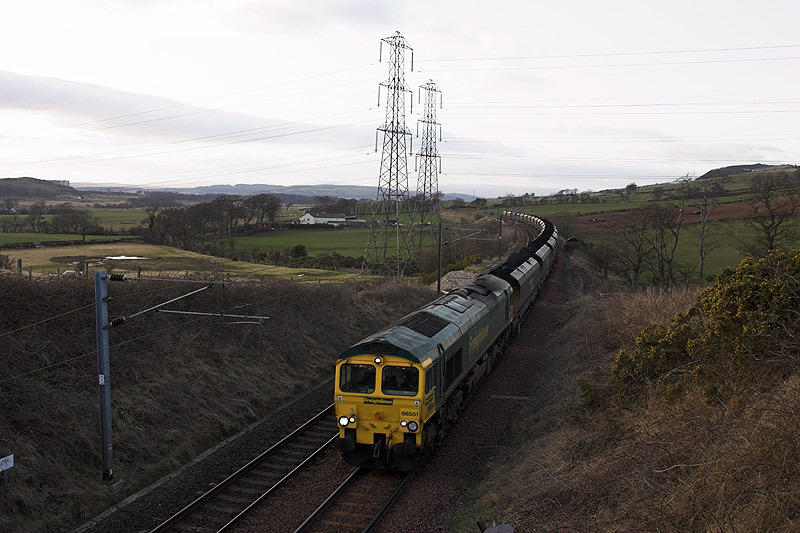 Freightliner Class 66/5, No: 66551, passes rough the North Ayrshire countryside at Crosbe Mains, near West Kilbride, after having just left Hunterston wth an unidentified southbound loaded MGR/Coal working on Fri 17th March 2006 at 17:43. 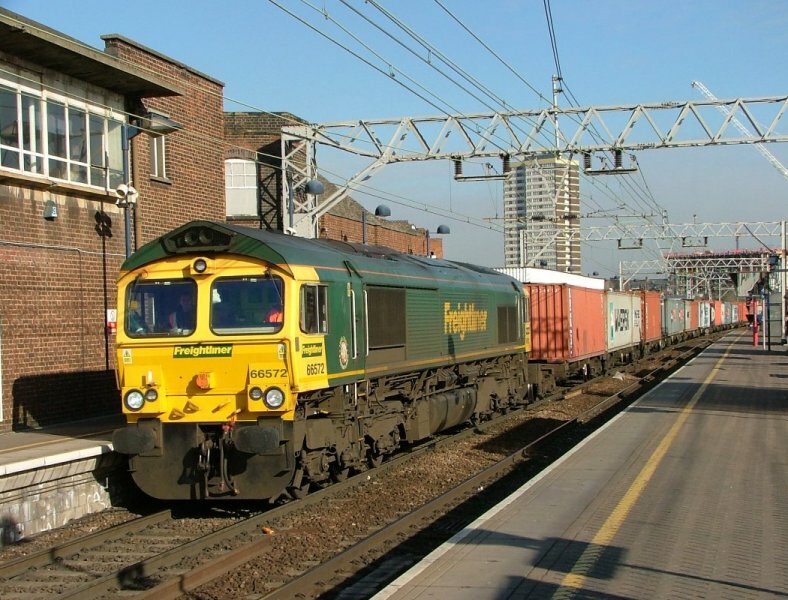 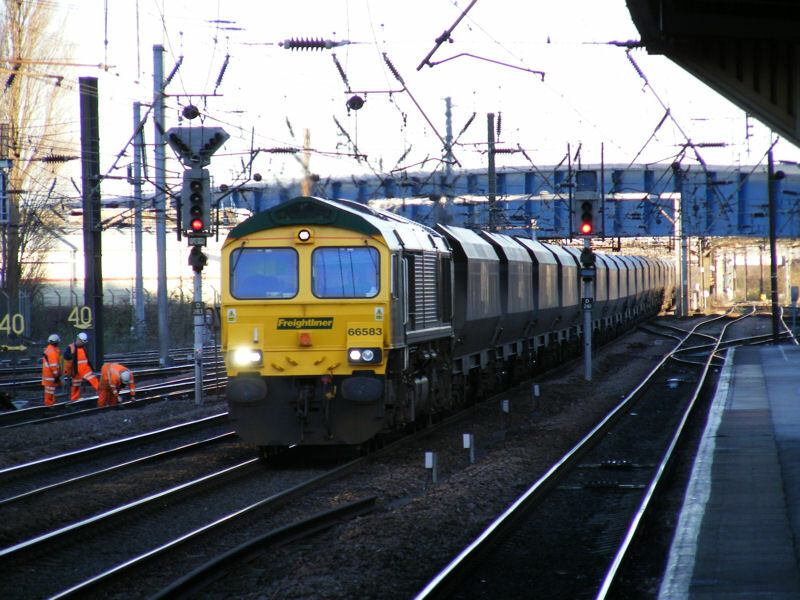 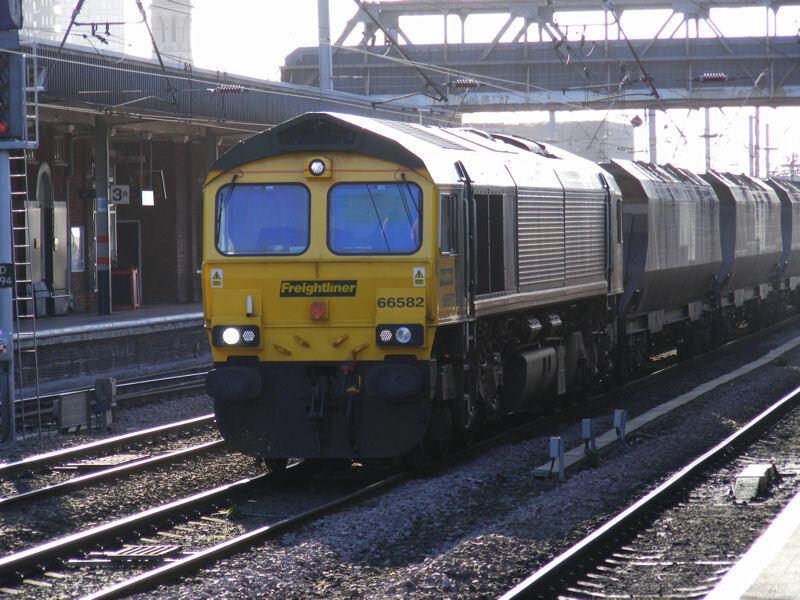 Freightliners 66559 + 66603 are spotted running through Watford Junction on February 18th 2003. 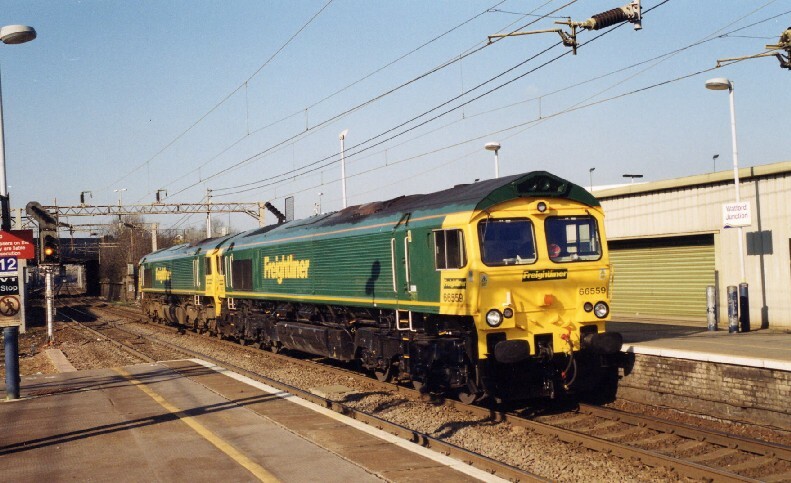 The 66'6' differs from the 66'5' in that it is re-geared giving it improved heavy haulage capabilities. 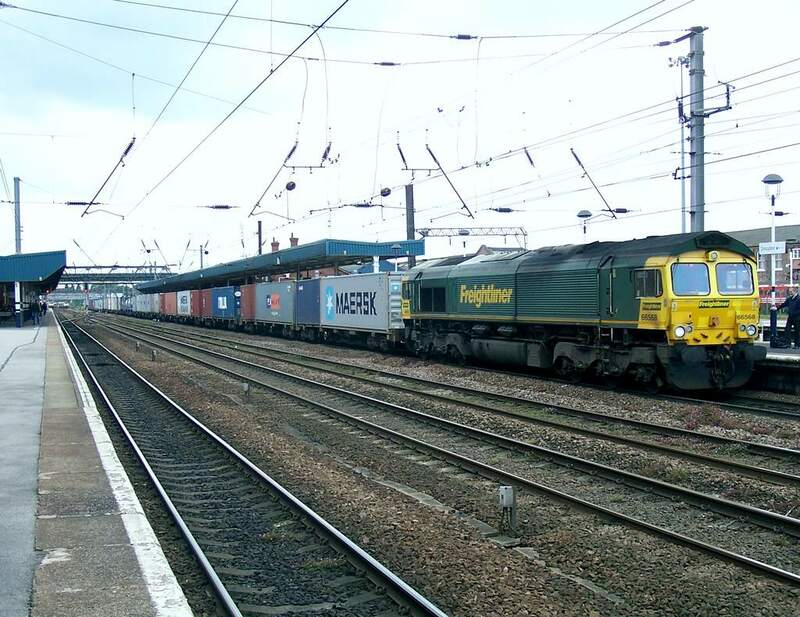 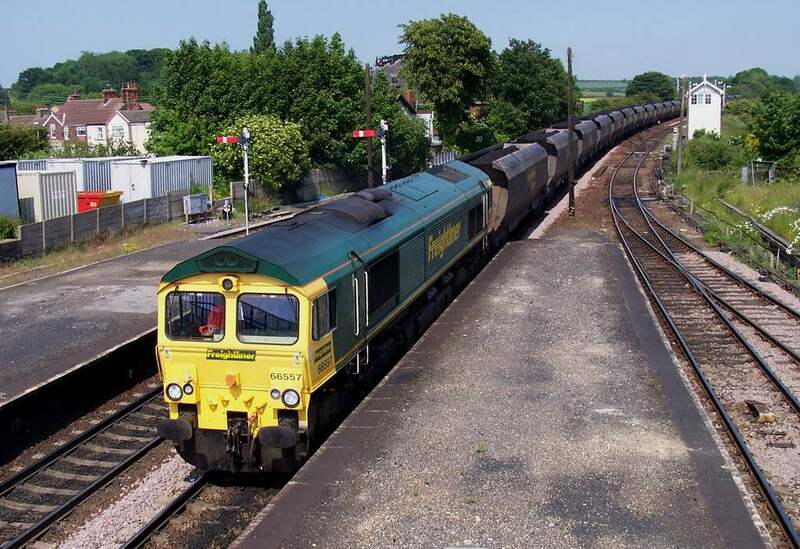 Freightliners 66571 brings an Ipswich bound liner through Ely on the 20th August 2004. 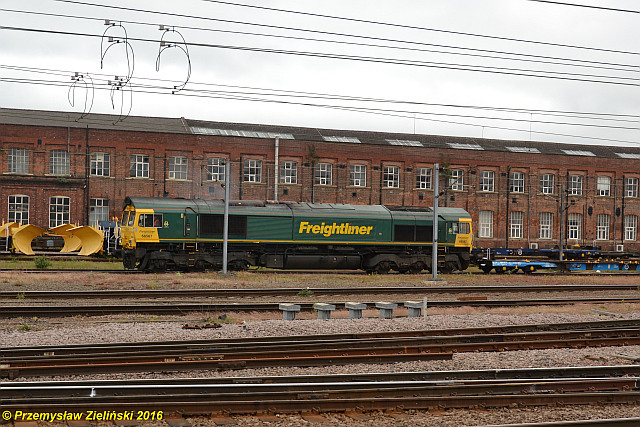 Freightliner Intermodal operate class 66s on most of their trains these days with approaching 80 in their fleet. 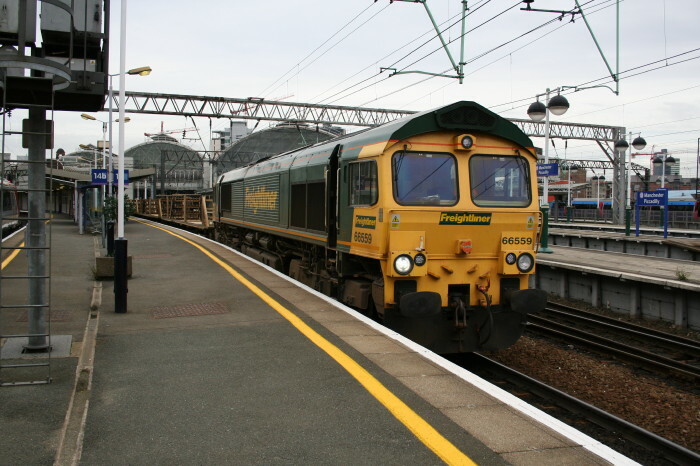 This example 66571 is seen on the North London Line at West Hampstead on the 26th November 2004. 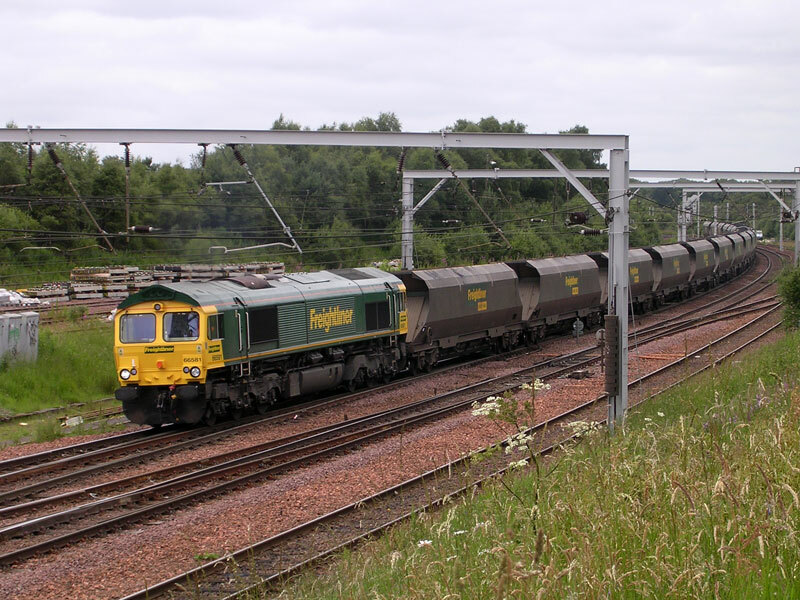 Freightliner Class 66/5 - 66581 approaches Carstairs with an unidentified loaded 'Heavy Haul' coal working from Ravenstruther on Fri 15th July 2005 at 13:35. 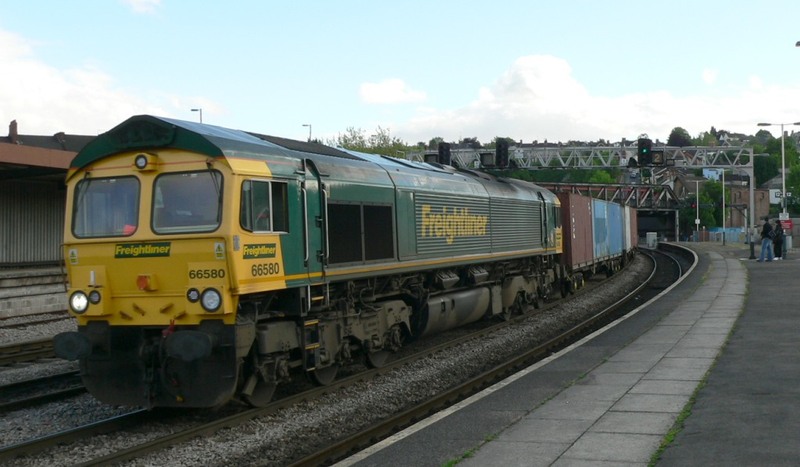 Freightliner Class 66 diesel locomotive 66580 hauls a container train eastbound on the approach to Newport station in South Wales. 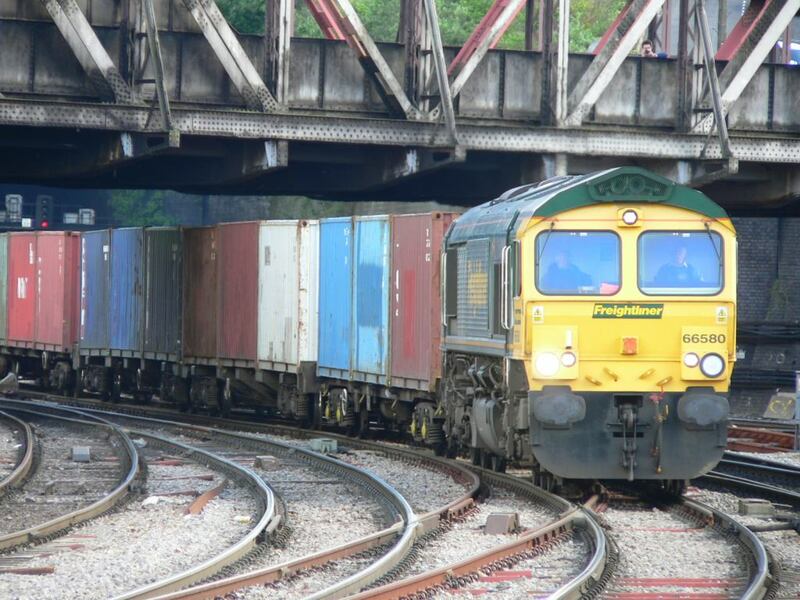 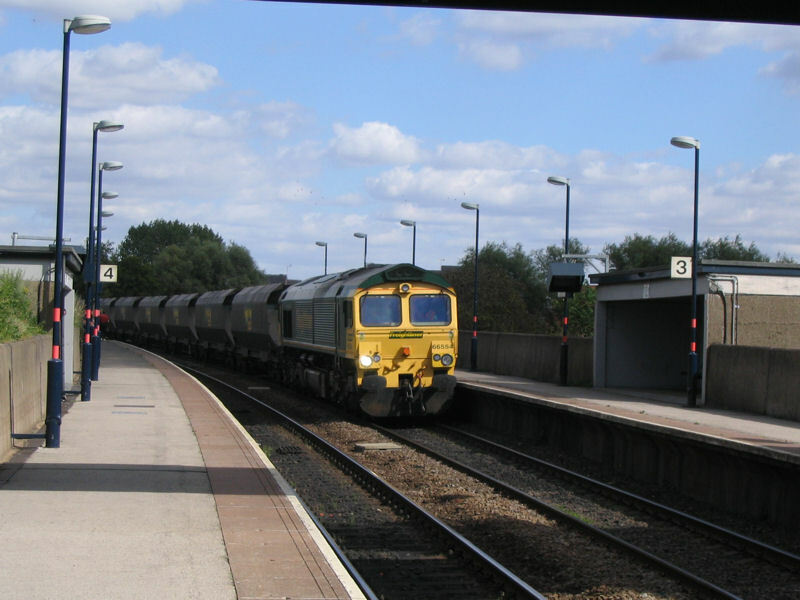 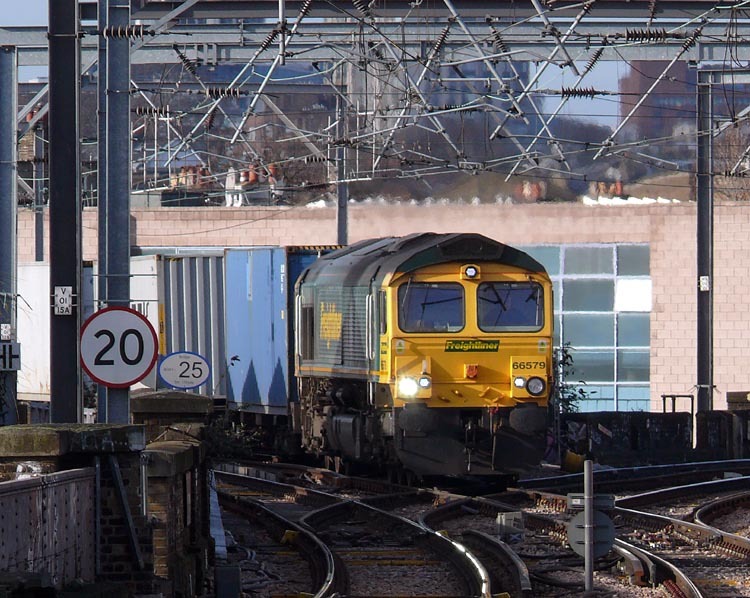 Freightliner Class 66 diesel locomotive 66580 hauls a container train eastbound through Newport station in South Wales. 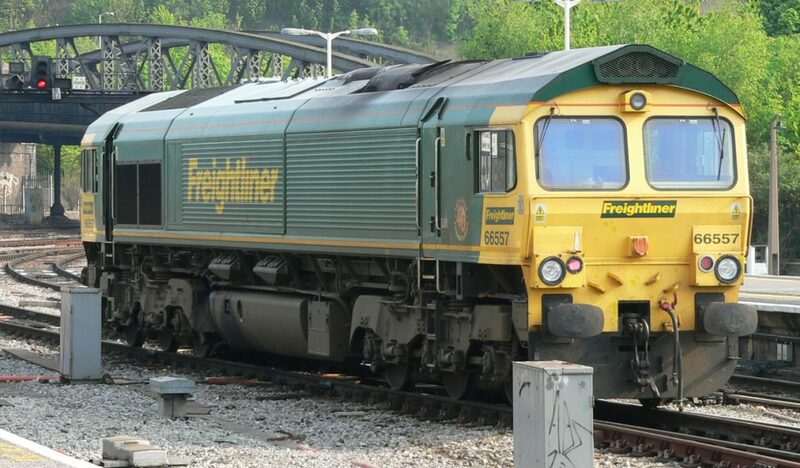 Freightliner Class 66 diesel locomotive 66557 waits at a red signal at the southern end of Bristol Temple Meads railway station. 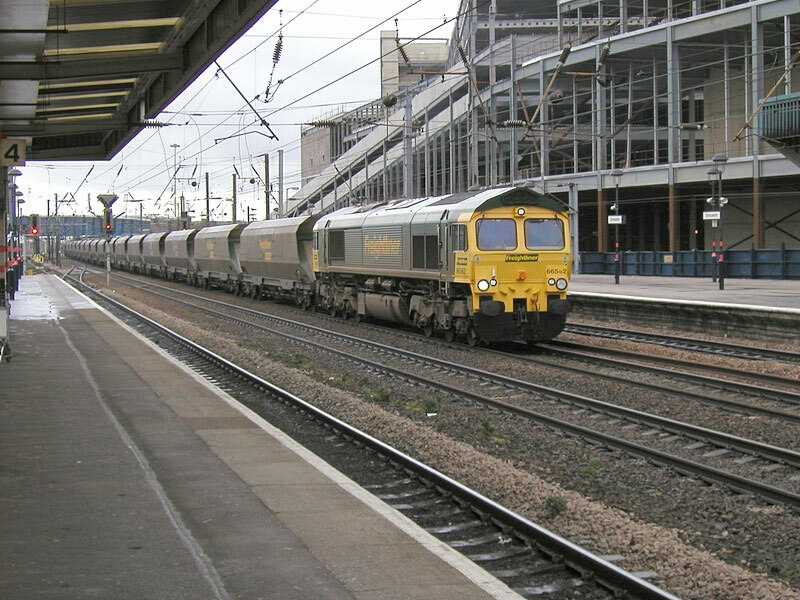 Class 66 Freightliner seen at Ipswich on 02 April 2004. 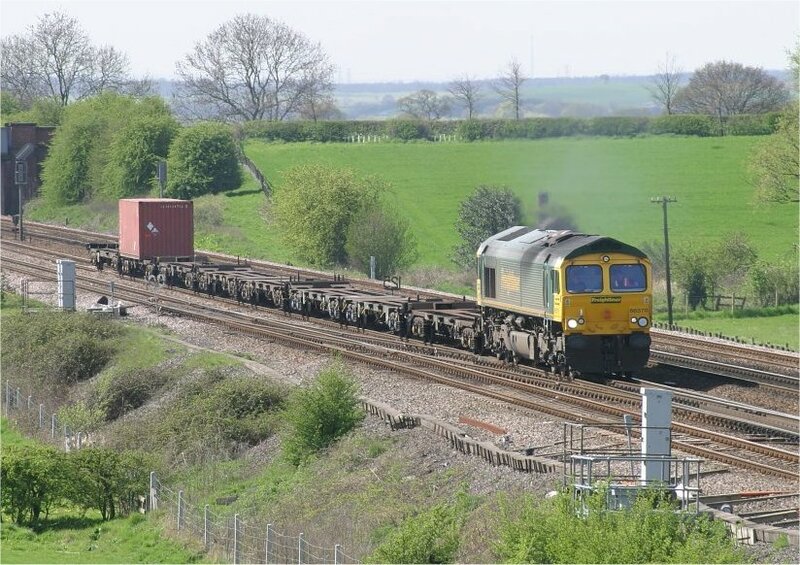 I very rarely take 'going away shots' but this is one which I ma pleased with, it is a brilliant location (Colton Junction, south of York). 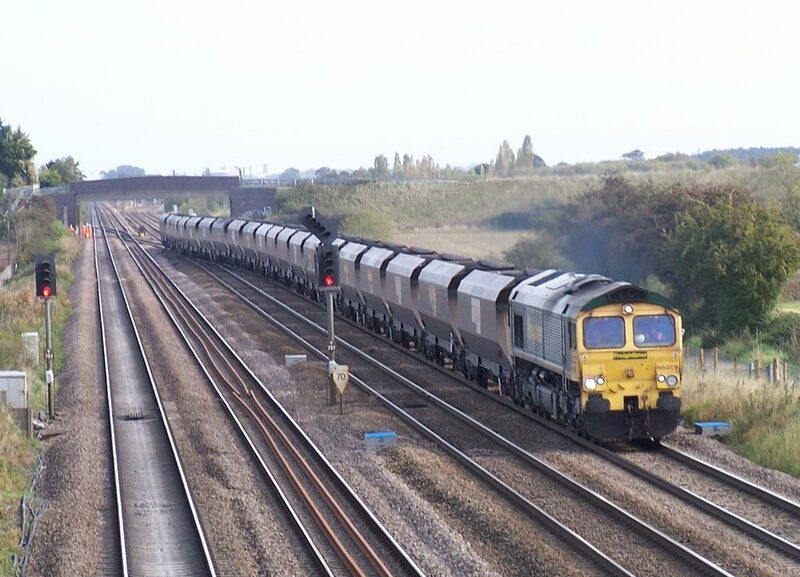 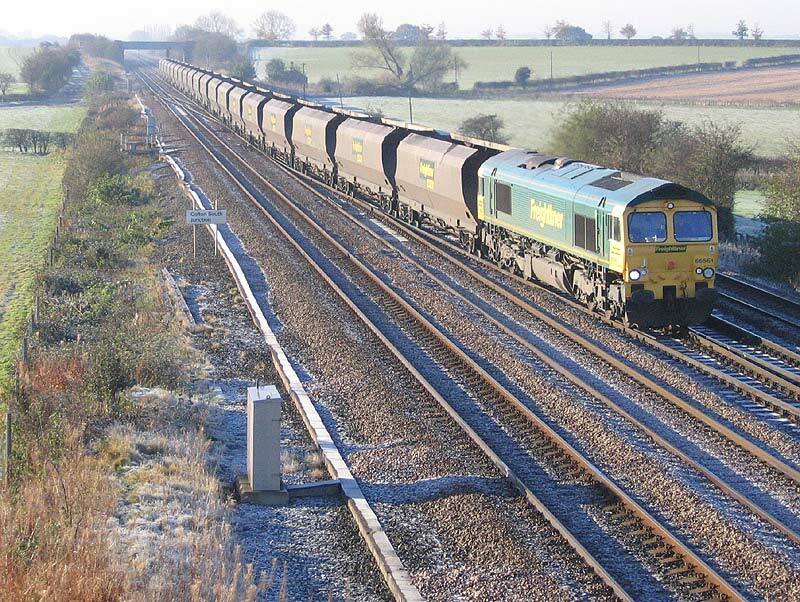 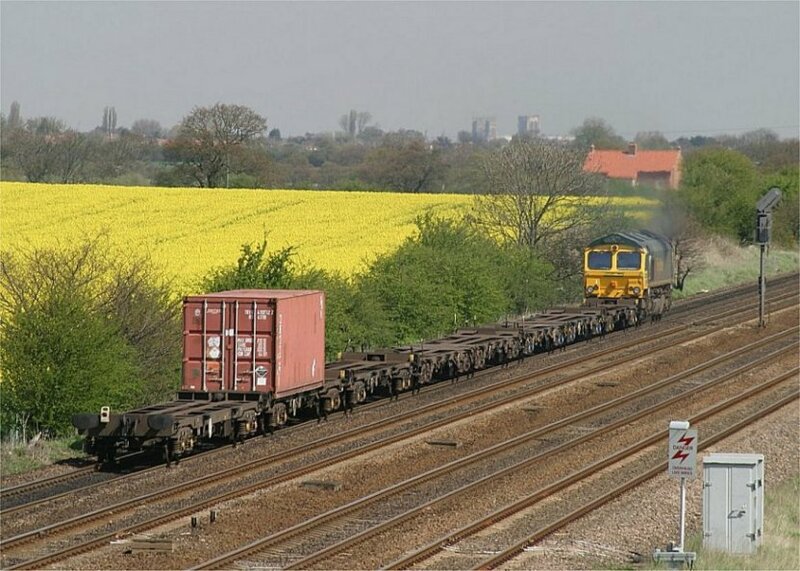 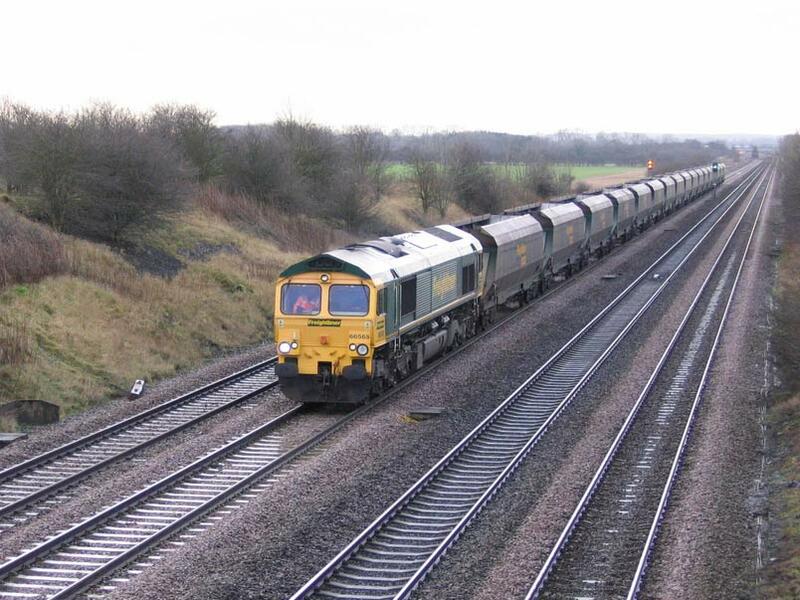 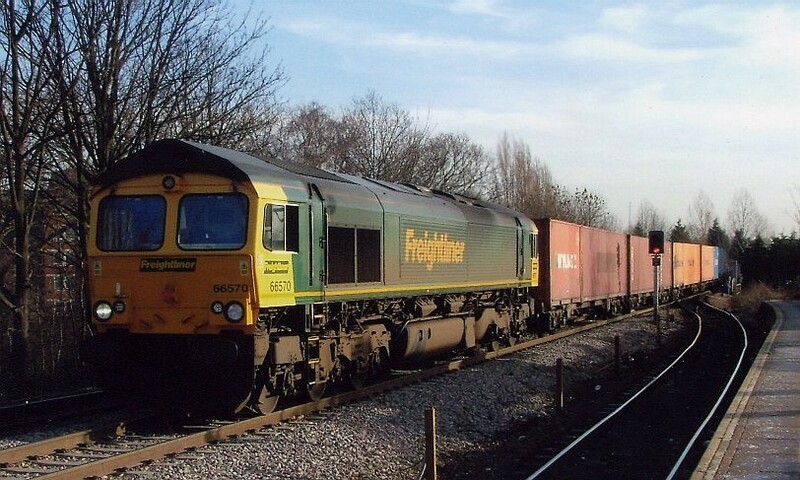 A very lightly loaded Freightliner 66 approaches Colton Junction south of York late April 2004. 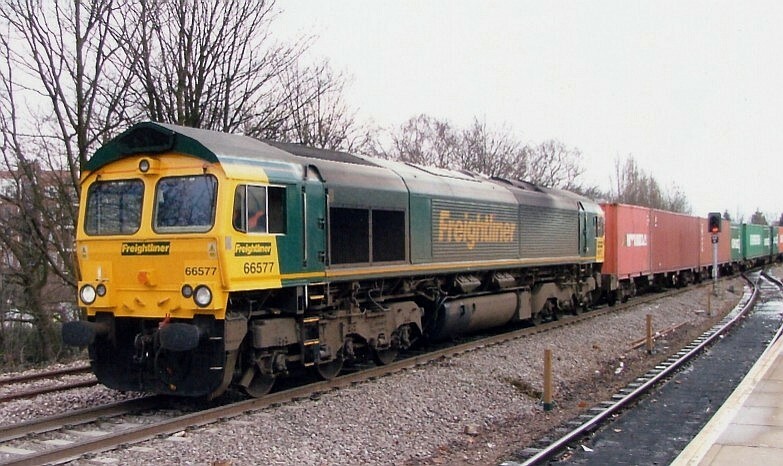 Freightliners 66570 runs through Gospel Oak on the 13th January 2005. 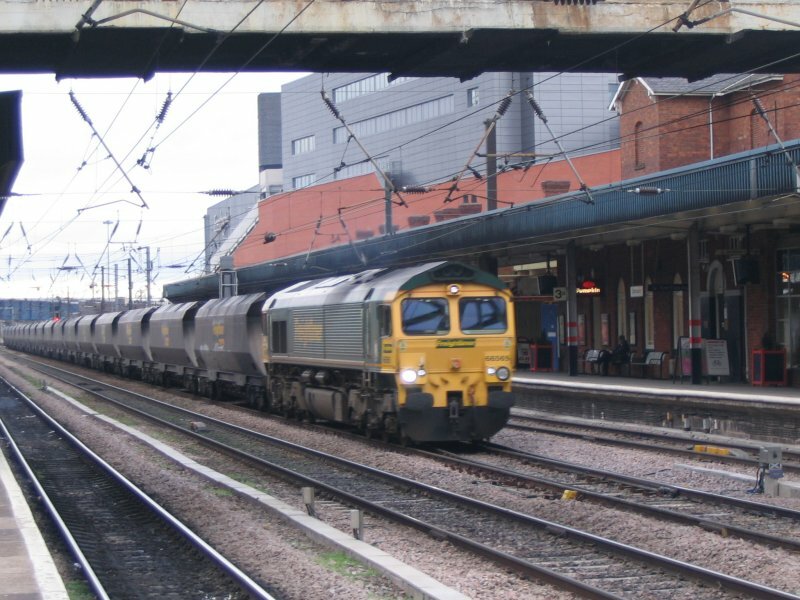 Most 'up' freights at Stratford come through Platform 10 but here due to a points failure all trains are having to use Platform 10a...which as can be seen is a real bonus for the photographer. 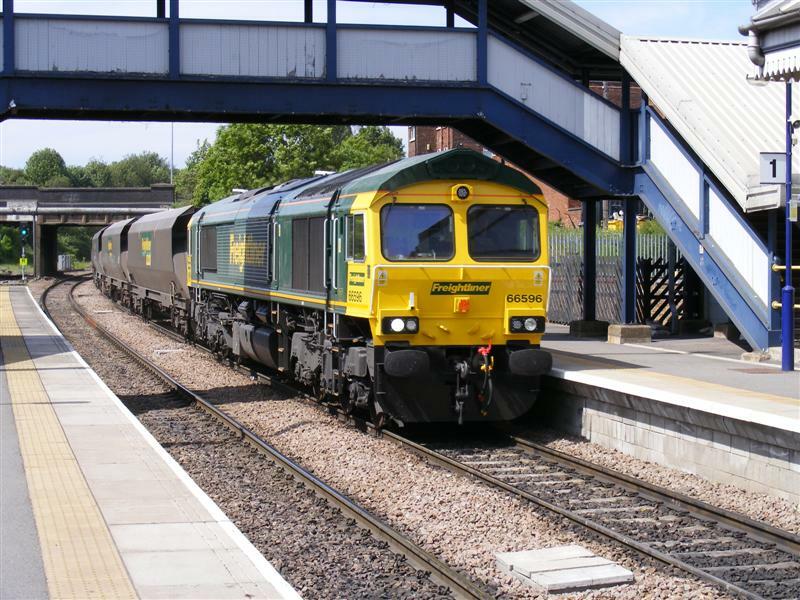 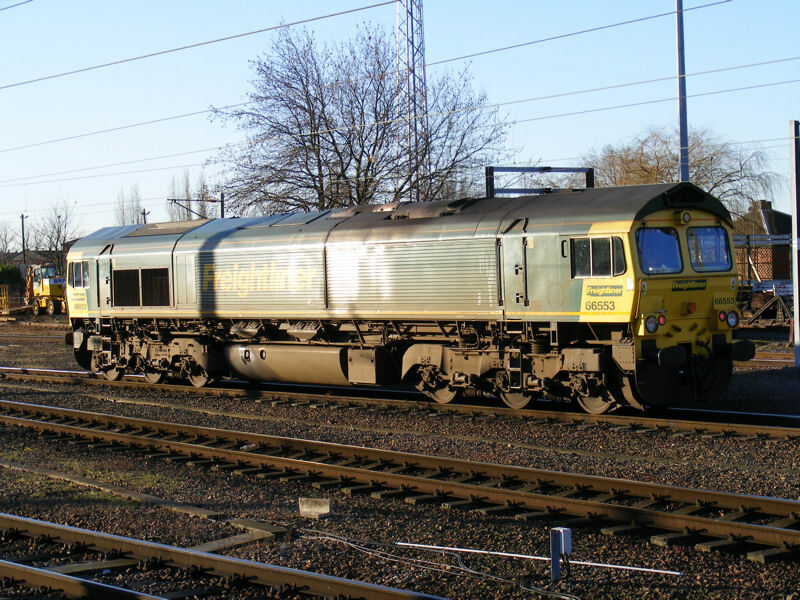 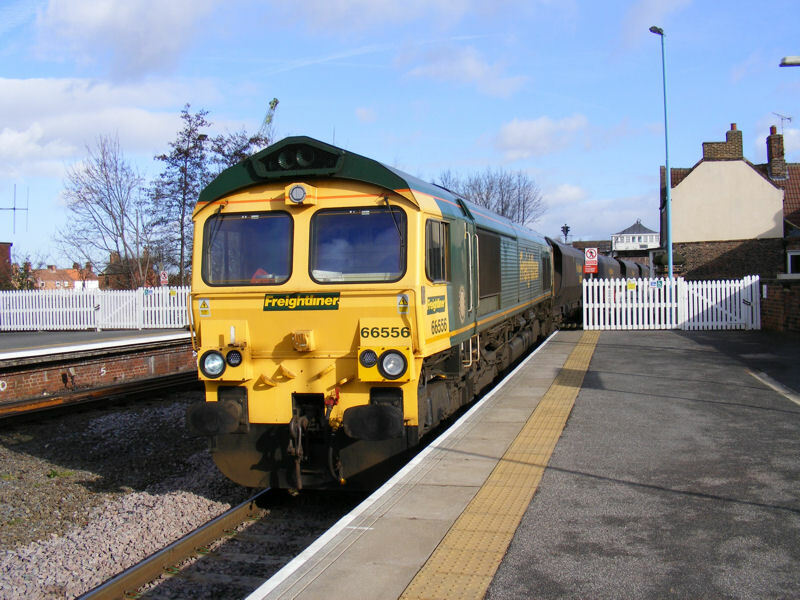 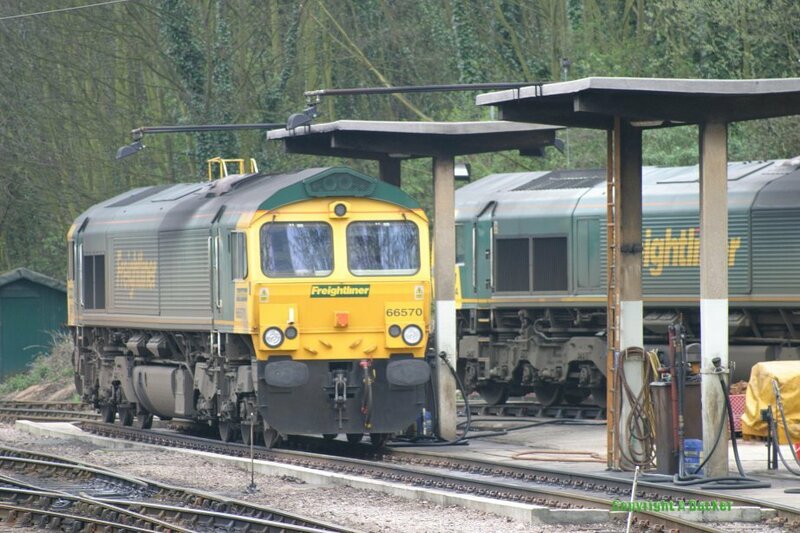 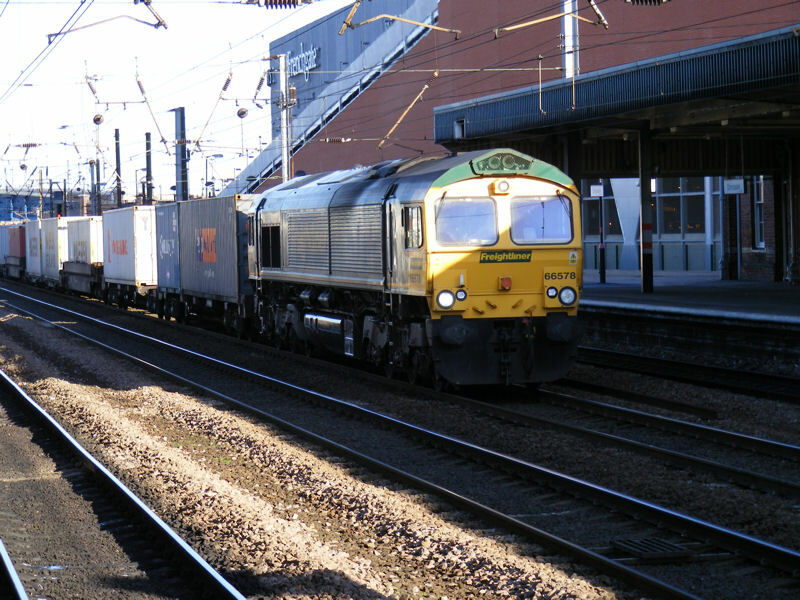 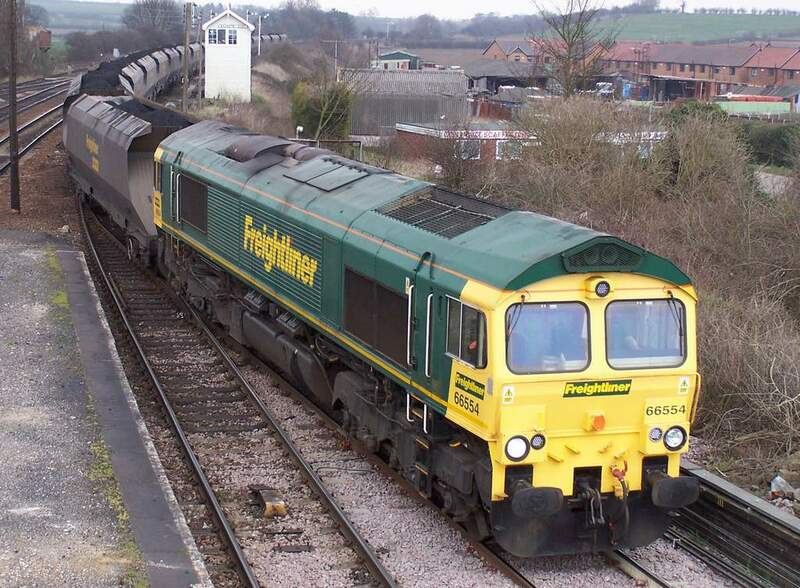 Freightliner's 66572 is seen making its way through the station on February 6th 2007. 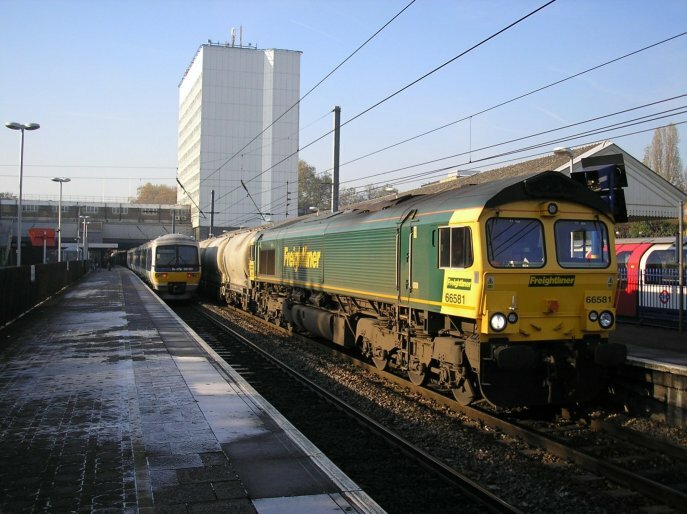 Freightliner operates a number of different traffic flows, one of these is this cement train with 66581 in charge seen running through Ealing Broadway on the 21st November 2005.